All the established by the Typikon divine services are performed in the church. On Sundays, the Holy Liturgy starts at 10.30am and the divine services of ecclesiastical feasts, when they occur on weekdays, start at 11am. If you wish to accept the Holy Gifts during the Sunday service, you can go to confession to Fr Simeon either at the vespers before the feast or on the feast day before the beginning of the Holy Liturgy. All the services are said and sung in Old Church Slavonic language, and the readings of the Apostle, the Evangelium, the Parremii, etc. are read in Bulgarian. Everyone is warmly welcome to our church where you can not only get the feeling of spiritual satisfaction during the divine services and the chants but you can also feel the brotherly communion of all the parishioners and you can even take part in the ecclesiastical activities which are carried out after the Divine Liturgy. The third year of the course entitled “Foundations of Orthodoxy” started in October 2015. The Course is undertaken by Dr Valentin Kozhuharov, lecturer in Christian Education and in Missiology. 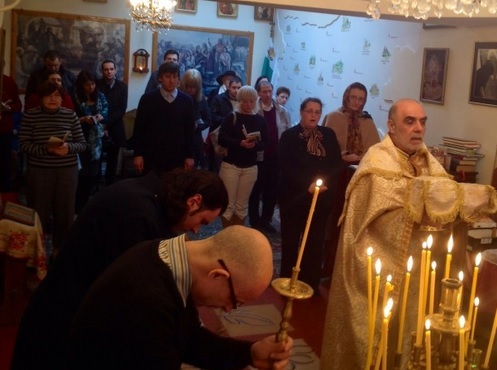 The classes take place every Sunday, after the Divine Liturgy, at the Bulgarian Embassy in London. Information about the course in 2013-2014 year.